Most people create beautiful landscaping in their front yards. Curving flower beds, lined with stones or rocks or edging. We did that, too. But we live in North Texas. Have you experienced a typical summer in North Texas? It’s HOT. Year after year, we would buy several flats of flowers and make the flowerbeds all pretty in the spring. Then by the end of June, the flowers start to look haggard. By August, the several days of intense 100+ degree heat will have fried the plants to a crisp. What did we have to show for all the hard planting work? Not much. Mostly a bunches of dried up, scraggly plants in the flower beds that have to be cleaned up. Bleh. What could we do to have pretty flower beds, but not toss a lot of money out in the compost trash when it all died? 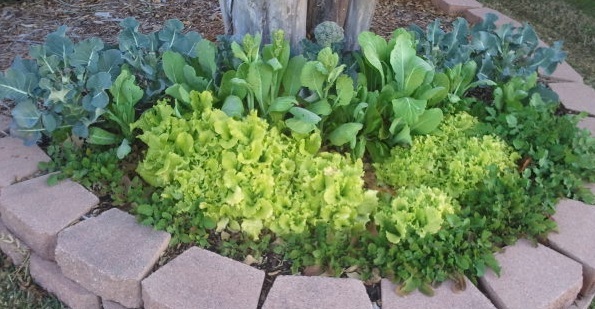 One of the side gardens with four different kinds of lettuce in front of the broc. Winter vegetables are very pretty and love the cold. If you’re in a climate that doesn’t have frozen ground in the winter and you want to garden, why not plant a garden in the front flower beds? One of the garden experts at our local feed store told me once that he doesn’t plant anything in his front yard unless it’s edible. He doesn’t have much of a backyard, so he takes advantage of what he does have. Would you plant your vegetable garden in your front flower beds? What would you plant? I’d love to hear your gardening plans or experiences!